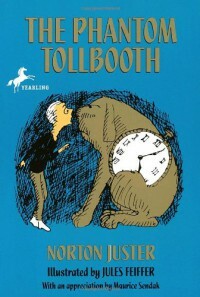 Michael Chabon has written an introduction to a new edition of The Phantom Tollbooth, which is reprinted in the latest issue of the New York Review of Books (June 2011 - you'll need a subscription to read the whole thing), and which prompted a reread. I will uncritically and unreservedly recommend this book to everyone. It's been my experience that while no singular author or book has ever consciously "blown my mind," many have done so unconsciously, including this one. How can you not love a world where you can only get to the island of Conclusions by jumping or where cars go without saying or where the Mathemagician transports our heroes to the Mountains of Ignorance by carrying the three? Like Milo, I can easily fall into apathy and I like to think that my various enthusiasms were sparked by his example.